It’s been busy at the Public Safety Center site! In the last three weeks, the contractor had two extremely successful concrete pours. 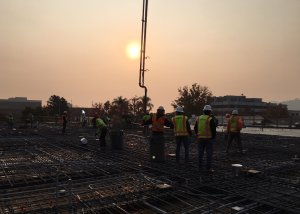 A total of over 1,000 cubic yards of concrete was placed by crews of up to 50 workers including truck drivers, concrete pump operators, concrete installers, finishers, and the construction management team. This was an “all hands-on deck” effort, and it has really paid off! As soon as the forms and shoring were stripped off the east side of the deck, the contractor started erecting the structural steel. 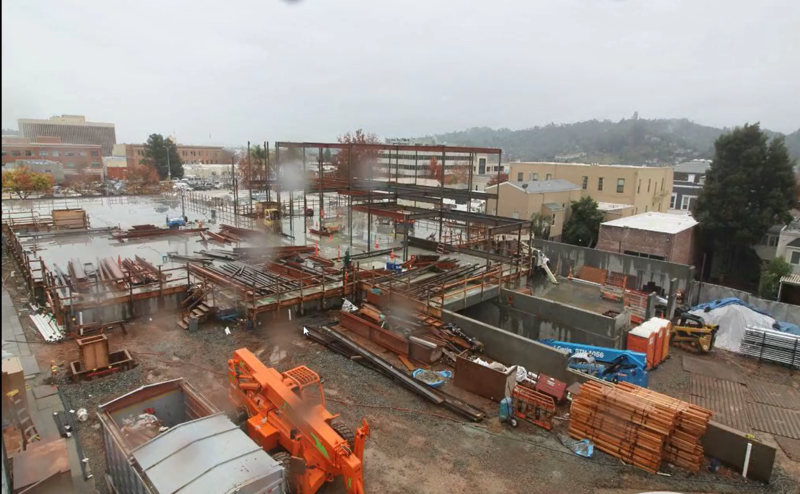 At an average rate of 12 steel columns per day, the contractor has made amazing progress, despite the rain. The crews are also lined up to go in the basement to start mechanical, electrical, and plumbing work in the next week or so. The construction team working on this project has been excellent. They have demonstrated a high level of coordination, planning, problem-solving, and critical thinking which will result in producing a state of the art facility that we can all be very proud of.